STIB public transport is much more than the daily grind. It is also there for everything that brings Brussels to life and makes it move: festivals, outings, museums, restaurants, and more. Today, in order to guide passengers, STIB is presenting its new chatbot. Cath & Géry will be available 24/7 to answer users' questions about things to do in the capital and how to access the different sites by public transport. Brussels is packed with all types of activities and places to go, whether you love music, you enjoy good food, you like to savour a drink on a terrace, or you want visit the many museums, etc. To help Brussels' residents, tourists and people passing through the city, to get the most out of the capital, the Société Bruxelloise de Transport Public (Brussels Public Transport Company) is launching its first chatbot. 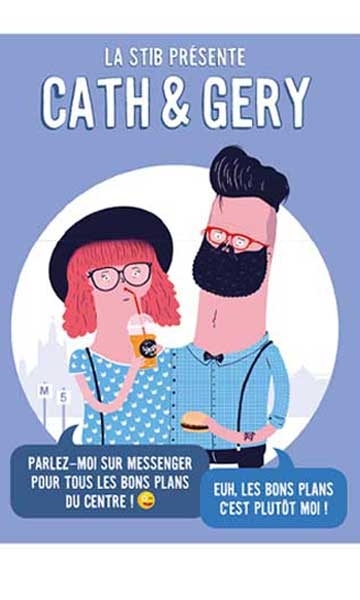 Two "Brusseleirs" hipster Siamese twins, Cath & Géry, are available 24/7 on Messenger to answer questions about things to do in Brussels as well as in "their" neighbourhood, Place Sainte-Catherine and Halles Saint-Géry. We're Cath&Géry and if you are looking for handy hints about what do in the centre, we're your man, well, you're woman... Well, both actually. The chatbot is based on real-time data from STIB and geolocation, combined with information from visit.brussels. By scanning the Messenger-code on the stickers and posters with a smartphone, or using the social networks, users are able to open a dialogue box in Messenger. They are welcomed by Cath & Géry in French, Dutch or English, and asked what they want to do. They are offered a list of activities and handy tips. Users are then invited to choose their type of activity and when they want to do it. They then receive a list of activities that match their criteria from visit.brussels. Once the activity has been chosen, users can click the button "getting there" and either enter their address or use geolocation. They then receive a personalised itinerary that they can use to reach the site by STIB public transport. This first chatbot is part of the new "Les Brusseleirs" communication campaign and will be followed by other chatbots, each of which will be dedicated to a neighbourhood in Brussels: Schaerbeek, Louise, Ixelles, etc. In total, by the end of 2018, at least six chatbots will guide people looking for new adventures. Each "Brusseleir" will represent a neighbourhood and will have its own identity, language and style. Thus, STIB is ever closer to its passengers and supports Brussels in all the activities which the capital offers, because public transport means much more than transporting thousands of passengers on the "daily grind", it also means accompanying them in a modern and fun way on their excursions and leisure pursuits.